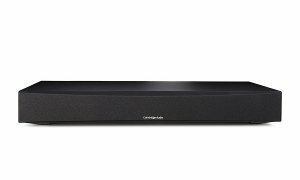 Cambridge TV5 Compact Base with Bluetoothr(black)(system) Cambridge TV5 Compact Base with Bluetoothr(black)(system) - - It's Free! : New Audio & Video, New Electronics at Lowest Prices! Upgrade you entertainment with the TV5 speaker base with Bluetooth. You’ll enjoy home cinema sound straight out of the box, with big bass, clear dialogue and fidelity for your favourite music. Two downwards-firing subwoofers deliver incredible bass – balancing performance with compact design. It keeps your subwoofer safe from knocks – perfect if you have children or pets in the home. We’ve made sure the TV5 is so strong it can support any TV that fits on its 725x340mm surface. Its composite wood cabinet minimises vibration and distortion – keeping sound pure. In addition, two 6.5” active downward-firing subwoofers provide rich, deep bass – vital for reproducing the crashes and thuds of any film or game. The TV5’s twin subwoofers mean that it has twice the surface area of bass driver and double the efficiency in bass response. These two combinations add up to a sound that is big enough to fill any room and match any big screen action. We are dedicated to delivering environmentally friendly products which is why the TV5 has a less than 0.5W standby power consumption and will auto power down if not used for 20 minutes.